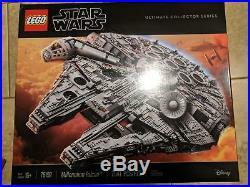 LEGO Star Wars Millennium Falcon (75192). The largest LEGO set ever! 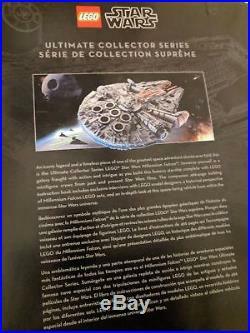 Includes 4 classic crew minifigures: Han Solo, Chewbacca, Princess Leia and C-3PO. Also includes 3 Episode VII/VIII crew minifigures: Older Han Solo, Rey and Finn. Figures include a BB-8 droid, 2 buildable Porgs and a buildable Mynock. 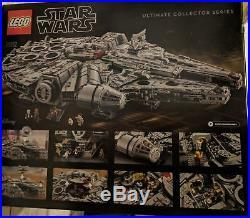 Exterior features include intricately detailed and removable hull panels, a lowering boarding ramp, concealed blaster cannon, 4-minifigure cockpit with detachable canopy, interchangeable round/rectangular sensor dishes, upper and lower quad laser cannons, and 7 landing legs. Main hold features a seating area, Dejarik holographic game, combat remote training helmet, engineering station with turning minifigure seat and a doorway build with passageway decoration. Rear compartment features the engine room with hyperdrive and console, 2 doorways, hidden floor compartment, 2 escape pod hatches, engineering console and an access ladder to the gunnery station. Gunnery station features a minifigure gunners seat and detachable hull panel with fully rotating quad laser cannon. An additional quad laser cannon is also mounted on the underside. This model includes 7,500 pieces. Also includes an informational fact plaque. Features a new-for-October-2017 cockpit canopy element. Classic crew weapons include Hans blaster pistol and Chewbaccas stud-firing bowcaster. Measures over 8 (21cm) high, 33 (84cm) long and 22 (56cm) wide. 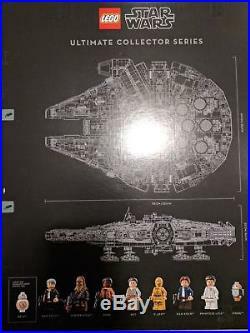 The item "LEGO Star Wars Millennium Falcon 2017 UCS Ultimate Collectors Series (75192) NEW" is in sale since Thursday, June 7, 2018. 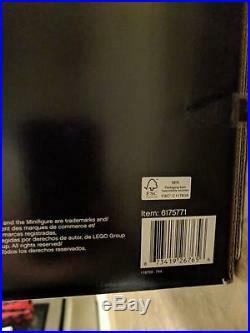 This item is in the category "Toys & Hobbies\Building Toys\LEGO Building Toys\LEGO Complete Sets & Packs".deals" and is located in Houston, Texas. This item can be shipped to United States, Canada, United Kingdom, Denmark, Romania, Slovakia, Bulgaria, Czech republic, Finland, Hungary, Latvia, Lithuania, Malta, Estonia, Australia, Greece, Portugal, Cyprus, Slovenia, Japan, China, Sweden, South Korea, Indonesia, Taiwan, South africa, Thailand, Belgium, France, Hong Kong, Ireland, Netherlands, Poland, Spain, Italy, Germany, Austria, Israel, Mexico, New Zealand, Singapore, Switzerland, Norway, Saudi arabia, Ukraine, United arab emirates, Qatar, Kuwait, Bahrain, Croatia, Malaysia, Brazil, Chile, Colombia, Costa rica, Panama, Trinidad and tobago, Guatemala, Honduras, Jamaica, Barbados, Bangladesh, Bermuda, Brunei darussalam, Bolivia, Ecuador, Egypt, French guiana, Guernsey, Gibraltar, Guadeloupe, Iceland, Jersey, Jordan, Cambodia, Cayman islands, Liechtenstein, Sri lanka, Luxembourg, Monaco, Macao, Martinique, Maldives, Nicaragua, Oman, Peru, Pakistan, Paraguay, Reunion.